EPF members who didn’t get their PF claim amount or advance due to incorrect bank account details need to submit a form called PF reauthorization form to their respective EPF office. If your PF claim settled but money not credited and the reason is the wrong bank a/c number of IFSC then you can use below PF reauthorization form to get the refund of your PF claim amount. PF reauthorization form is also known as A.S.R form used to get the refund of unsettled EPF claim amounts. EPF members can submit this form for both offline claims and also for online claims. You can download PF reauthorization form by using below link or you can also get a copy of PF reauthorization format your regional EPF office. Write your regional EPF office address to which you have submitted your EPF withdrawal forms. Under subject mention your EPF account number / UAN number. Now enter your returned EPF amount and also enter the date of claim settlement, you can find these details in EPF claim status portal. Enter the returned EPF amount on fields wherever required. Now enter your correct bank account details such as bank a/c number, IFSC code, bank name ban address. After writing your bank account details now write your personal home address. Now sign the PF reauthorization letter and also take your employer attestation. 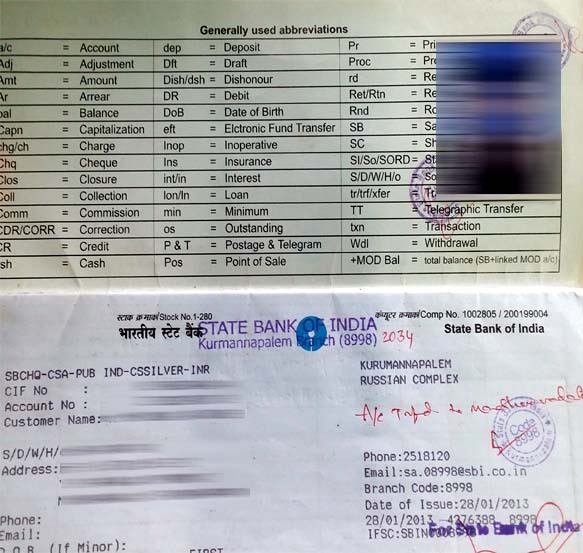 Cancelled Cheque or Copy of Bank Passbook. Once you submit PF reauthorization form to your regional EPF office then within 10-15 days you will get the refund of your PF claim amount into your bank account. Yes, you can submit PF reauthorization form through speed post and remember there is no tracking system to know the status of PF reauthorization form. you have to wait for 10-15 days, if you receive your PF claim amount then it is OK otherwise raise a grievance at PF portal. Yes, you can submit it. But if you don’t want to visit your PF office then correct your bank account details online at UAN member portal. Once your employer approves your new bank account details then you can again claim your PF amount. Correct your bank account details at UAN portal and after your employer’s approval reapply for the PF claim. The failed amount will again credit back into your PF account, So submit PF reauthorization form to your regional EPF office with correct bank account details or correct your bank account details online at UAN portal and reapply the claim. Hi Rajesh ,I am called for the same issue I applied for my pf 19 form through online at 1 St April after 10 days when I checked my claim status I got the information that amt settled by NEFT returned back to pf office due to wrong account no because my company hr wrongly updated my account no .so I contacted my hr and she give me the information that first change account no through kyc and after employer approval resubmit claim through online portal again .I want to know whether authorization letter needed or any change for claim rejection because once claim is already settled. If you have applied for PF claim online then again you need to reclaim your PF amount online at UAN portal. If you claimed your PF amount offline then you need to submit PF reauthorization form to your PF office. hi what to fill in the home address? Hi Santhosh Kumar, Better mention your present address i.e Bangalore. I applied for EPF and EPS claim on 2nd April 2019 but soon realized that the IFSC code present is incorrect and i am sure amount will not get credited into my account . 1. Can i raise a grievance to reject/cancel my claim so that first i make the IFSC code corrections and then reclaim the PF? 2. If PF office doesnt agree with option 1 , can i make correction in PF portal for IFSC and after employer approves can i reclaim the same through online ? 3. Is re authorization letter mandatory or we can reclaim it through online PF claim option after necessary bank details correction? Correct your bank account details at UAN portal and ask your employer to approve it. After approval reclaim your PF amount. There is no need to raise grievance. 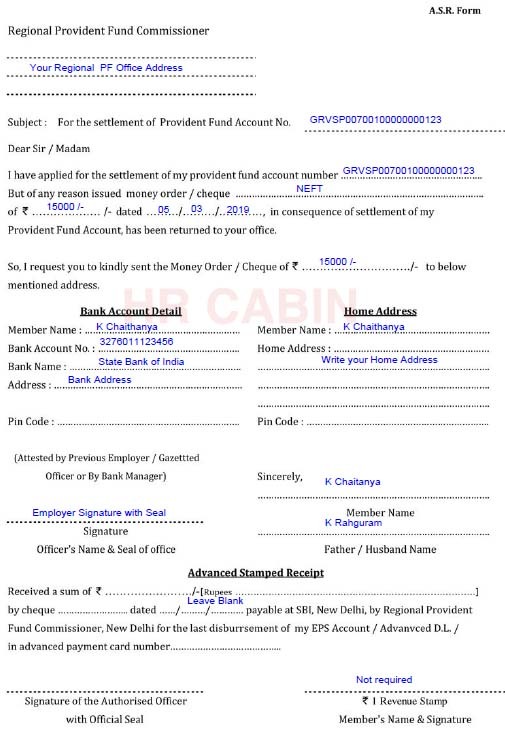 If you want PF immediately then you can submit PF reauthorization form to your PF office with correct bank a/c details. I have received the below message from PF team, our Bangalore office is not ready acknowledging the reauthorization letter, so i have sent mail and courier the documents. Please guide me any alternative option, how i can process it. do i need to raise grievance in RO office. request you to help on this, as I am physically challenged person, unable travel to our old office frequently. This is with reference to your Grievance registered vide Registration Number ROKKT/E/2019/00570. The PF A/C number, establishment mentioned in the grievance falls under RO, Park street. Please contact the employer for the matter. As per record F-31 settled of rs 80000/- on 26/02/2019 and NEFT payment return back on 28/03/2019. You are requested to submit re-issue proforma. Submit PF reauthorization form to your PF office with correct bank account details (or) correct your bank account details online at UAN portal and ask your employer to approve them. Once they approve it then again claim your PF amount online. The above msg showing after the grevance file Can you please tell me what to do now at the On the basis of this message I’m Can I apply again, my passbook has not been updated yet..
You don’t need to worry about passbook updation, it takes some time. So you can reclaim it or submit PF reauthorization form. Now my details is correct I check in member home Portal also approved by employers. But still there not update my passbook amount which have deducted on cliam.please confirm me have any issue if I rease my claim again because some person asking me don’t cliam again if your passbook not update.. Thanks for the update, but in my passbook, m not sure photo attested and name is not there on cheque leaf. and i won’t know the PF amount and date. will our organization PF team, will help me on this. and i went to my old office, HR is not aware of re-authorization letter. and asked to send a mail to local HR and he will route it our kolkotta HR. You can get new passbook in your bank or open a new bank account or you can also get a new cheque book from your bank with a printed name. I have registered complaints in PF grievance, but not attached documents when i raised and today m trying to attach the documents. It saying time has been expired to submit the document, do i need to register once again and still i have not received reauthorization letter from old company. You can again raise a grievance at PF portal it is not a problem. You don’t need to get Reauthorization letter from your employer, you can download it and take your employer attestation and submit it to PF office. My name is swapna. I applied for pf claim through online. It got settled but returned due to incorrect bank account number. Now I corrected the bank account number and my employer approved it now. If I reapply for claim again through online will it credit? In some portals saying that if we reclaim it will reject like that. Is any one got success this reclaim again after correcting the bank number. Please suggest because I am out of India now. To send reauthourizayion form to of office I cannot come to India now itself as I have family here. Please post your suggestions. You can claim it if your bank a/c details were approved then sure you will get your PF claim amount. Thank you very much for the suggestion. I will give a try on online once again by submitting claim. My claim amount still not yet added to my passbook . Do I need to wait till it credited to passbook? or can i submit claim now itself? please suggest.